This section is for promoting and recognizing our local installers and Automotive Related Partners. These are some of the Local Automotive Related Businesses that we work with, again if you are looking to get something installed, your vehicle detailed or need a good reliable paint shop, check out our partners. Better yet, if you see something you want installed and already deal with an automotive shop, let them know where you found us, and maybe they would be interested in being listed here. If you just bought (or considering) a new car or truck from a local Dealership and are looking to fill in some of the aesthetic gaps, take a look at our online auto catalog to see what we can offer. Many Phoenix Valley Dealerships offer Beaver Stripes' Accessories and Graphics for their vehicles. Just ask for the personalized trim for your vehicle, sometimes you may have to find the Service Manager or Parts Manager to get your personal accessories. Local Stripes, Graphics, Molding & Accessories Installers. These Installers are Mobile and would be able to come to your location for installations. We offer these contacts understanding that the valley is growing and it is not always convenient to make it to our shop. Beaver Stripes Does Not Warranty any work performed by independent installers, but do recommend the best in the valley. If you do happen to have an issue with anyone listed here please let us know, so we may help resolve the issue. Also let them know you found them here. Better yet, if you are pleased with their work, send us a comment and or photo(s) and we can share their work with others. The Beaver Team is also available, with Limited areas. Contact us for more information.Graphics, Molding, Pin Striping, Paint Protection Film and More. Mostly our team concentrates on Fleets and RV's, but we always have an installer at our shop to take care of the small jobs. Hand Painted Stripes and Custom Graphics. Hard to find these days, but they are still out there. If you are interested in Real Custom Stripes and Lettering, these are the people you are looking for. Including Airbrush, Artistic & Personalized Details for your ride. Some of the best in the Valley and State! Automotive & Fleet Detailing Services. Local Mobile Detailing and Services. For Cars Trucks, Vans, SUV's along with Boats & RV's. We use these Detailers many times when we are re striping RV's and or Boats, as you will get better results with a clean and fresh surface to start with, after removal of the old graphics. Valley Wide, Personal and Fleet Services. Simple Detail to Full Buff and Recondition of Vehicles. Valley Wide Since 1987, Automobile Appearance Specialists Full Service Power Wash, Buff, Restore and Detail Service. Valley Wide Service. Power Washing, Carpet Cleaning, RV Buffing and Detailing. Valley Wide, Individual and Fleet Services. Simple Detail to Full Buff, Over Spray Removal Specialists. Beaver Stripes in very active in expanding our business with the digital age. We are looking to start publishing and distributing Monthly or Quarterly News and Events Related to our Industry. To be able to do this legally we are asking for anyone interested to sign up on our e-mail contact list, and adding beaverstripes.com to your address book. We do not intend on bombarding you with junk mail, but rather more interesting items you may be interested in and only as often as you "opt in" for. We will be focusing on local events (automotive related) that we will be gathering from shops and clubs that deal with us. See the links on the right to give you an idea of the information we will be including, some of this you may already be subscribed to, but just as we do, you may have missed one thing or another. But we will also be adding comments and reactions from other shops in the area. We would also like to offer a weekly, biweekly, or however often your shop may need, a reminder to check inventory on the often forgotten items needed to deliver a vehicle. Such as Detailing Products, Pin Stripe Roll Tape, Common Wheel Well Edge and Door Trim. Paint Protection Film for Door Handles, Door Edges, Rocker Panels and other small areas that need to be replaced or added before delivery of the vehicle. See our weekly Delivery Section for more information. This would be set up to be delivered a day before your scheduled delivery day. And you will have many options of ordering, such as e-mail respond, fax or call the order in. Eventually we will have online ordering, and you will be able to place the orders as you need and then request an emergency delivery if needed. And if that is not enough, we would also like to invite Local Shops to link their web sites to ours, and we will return the favor. The reason for this? Anyone who knows about Google and other Search Engines, knows that the more links and back links that your site has the better your results will be. But more importantly, you would be able to offer your customers a link to help them find replacement parts or accessories they may want to add on to your existing work order. Hmmmm that's not a bad idea is it? Lets all start our own little community and survive this mess that we are experiencing together as a team! 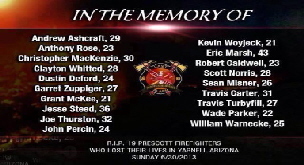 In memory of the Firefighters that left us on June 30th, 2013, Beaver Stripes has partnered with many local support and non profit groups that will be supporting the families of the fallen heroes. 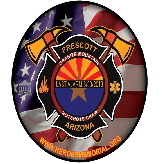 We originally started with the badge that was created by Heroes Memorial Foundation, cleaned it up a bit to be more clear and readable. With their approval we offered some small 4" round decals, with the donations (100%) of the first 1000 decals of $2.00 each to be donated to the 100Club.org.